In recent years it is said that some of the tenants had complained of hearing unusual banging coming from the kitchen, toilets flushing by themselves, unusual voices recorded on gallery computers and windows that appear to open by themselves after hours. A woman who had worked in the Art Gallery (large ground floor room) in the building had said she had seen a teenage girl several times. The girl was dressed in a maids uniform and was usually sighted by the old kitchen area. (Unfortunately no-one now seems to know where the kitchen area on the ground floor was). Urban legend is that the building was a nunnery and that the ghost of a nun has been seen. Frances Baker swears she works with ghosts. ”I would suspect that she’s a junior maid, a scullery maid or something like that,” says Frances, who insists that over seven or so years working in Lopdell House, the Titirangi arts centre, she has been treated to regular sightings of the maid’s spirit in and around the old kitchen. ”She’s nice. She’s just a sweet, simple, young girl.” Add to that other reports from staff members, peculiar human-like sounds recorded on the gallery computer, riotous clinking and clanking in an empty kitchen, toilets flushing and doors opening in empty corridors, and it’s not as if Frances’ experiences are isolated. Weather: A humid autumn evening with patches of light rain. Overnight low of 9.2°C at midnight. Northerly winds gusting to 11kph. Lunar phase: Waxing Crescent (10%), 3 days after the New Moon. 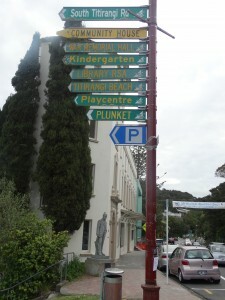 Lopdell House was first opened as Hotel Titirangi in 1930. In 1942 it was bought by the Ministry of Education and became a school for the deaf, and then a teacher’s residential centre named Frank Lopdell House. 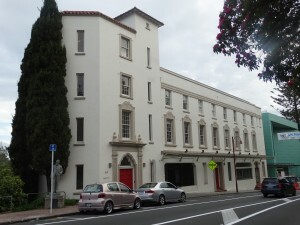 The Waitemata City Council (later Waitakere City Council and then merged with Auckland Council) purchased it in 1983 and reopened it in 1986 as an arts centre. 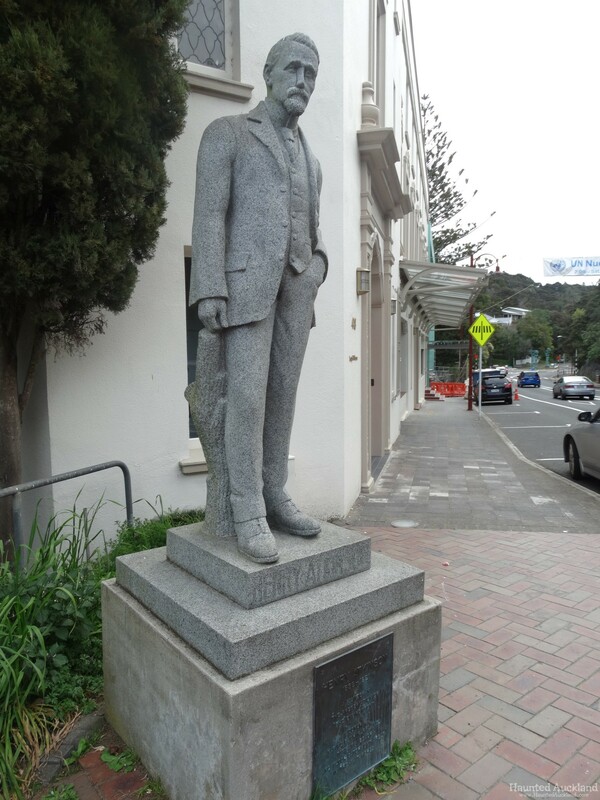 Adjacent to the house is a statue of Titirangi founder, Henry Atkinson. The original architects of Hotel Titirangi are Messrs. Bloomfield, Owen and Morgan of Auckland. 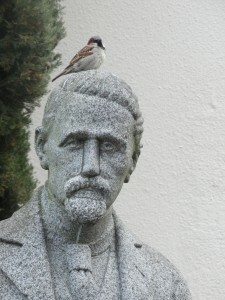 William Swanson Read Bloomfield was one of the original directors of the Hotel Titirangi Ltd company. He was born in Gisborne and is considered to be the first qualified New Zealand architect of Maori descent, having trained in England, Europe and at the University of Pennsylvania, USA. Bloomfield retired in 1959 and is also known for the design of Queen’s Arcade (Queen St), Yorkshire House (corner Shortland and O’Connell Streets) and the Masonic Temple (St Benedict’s St). Designed in a Spanish Mission style to accommodate over 60 guests, Hotel Titirangi was noted for having central heating, hot and cold water in every bedroom, and private bathrooms attached to five of the 24 bedrooms, all of which were fully carpeted. The building also had tea-rooms, two shops, a post office, a roof garden and a garage below. The main room on the ground floor was a tea room and cabaret, running the whole length of the building to accommodate 200 people, with a dining room on the first floor. The cabaret featured a special dance floor laid down on rubber buffers. Particularly innovative was the installation of a “Wireless and Talking Machine”, which allowed music or talking to be simultaneously broadcast to the cabaret, roof garden and all landings. In 1935, alterations were undertaken to add a new lounge on the roof, to enlarge the tea room and dining room, and to convert a shop in the building to a private dining room. By early March 1931, the Hotel Titirangi company was put into liquidation, blamed on “the present dull times.” The Hotel never secured an alcohol license, becoming known as the ‘pub with no beer’, and struggled to attract patrons, most business being done by the restaurant and tea rooms – a nightclub was added towards the end of the decade but struggled without a license. In July 1939, the then owner-occupier of the hotel, Leonard James Shrubsall (Mr Finlay) was charged and fined for deliberately selling alcohol without a license in a no-license area, and a large quantity of liquor was confiscated. In 1939, a Mr George Hunter took over the lease and changed the building’s name to the Titirangi Country Club, occupied by his wife, family and other relatives, and managed my Max Hunter. It was established as a country club for members, who were allowed to introduce guests that could use amenities such as tennis courts, a ping pong table etc., and it was proposed that, as a dwelling for Mr Hunter and his family, it is exempt from licensing regulations that would apply to a restaurant or public dance hall, but a police raid and subsequent case in 1941 proved otherwise. In June 1942, Hotel Titirangi was purchased by the government for use as a residential school for the deaf. More than 60 students arrived in September 1942 while alterations were still in progress. In 1960, the school transferred to purpose-built premises in Glen Eden. After functioning as a school for the deaf, the building was used by the Department of Education for in-service teacher training. It was renamed Frank Lopdell House in 1960 after the Superintendent of Education and became a venue for week-long training courses. Music courses for primary school teachers were a particular feature of the in-service teacher-training programme. One course aimed to instruct up to 35 teachers to play simple melodies on a range of instruments in as little as two days, which was described in a Southland News report as a “mild revolution” in music pedagogy. Frank Lopdell House was vacated in 1982 and purchased by the Waitemata City Council. It was then leased to Lopdell House Society in early 1985. 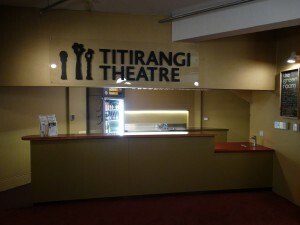 Later in 1985, the Titirangi Drama club (now Titirangi Theatre) took up a separate lease with Waitemata City Council for the sub-basement, which they held until 2012. 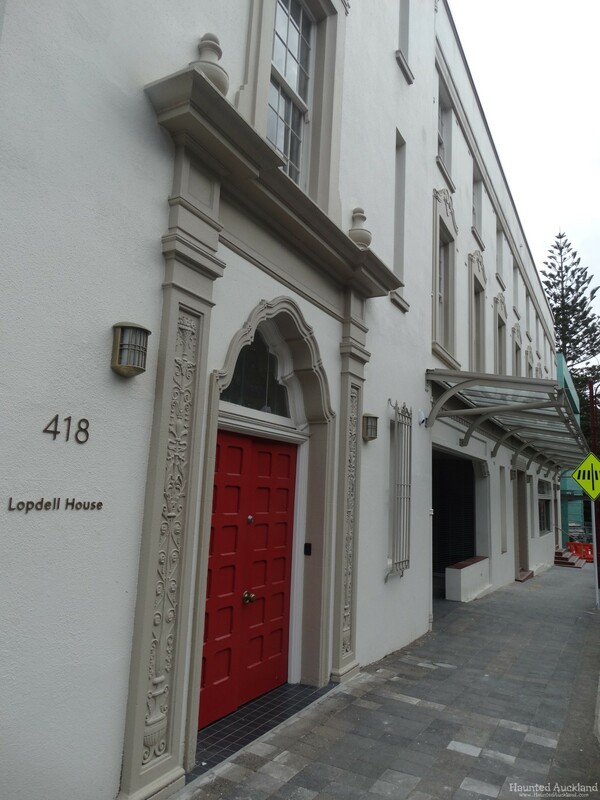 On 19 November 1986, Lopdell House Society reopened the building as the Waitemata City Arts and Cultural Centre, later simply known as Lopdell House. 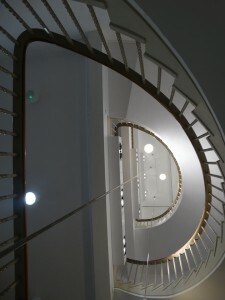 Lopdell House Society, trading as Lopdell House Gallery, occupied the ground floor with offices above and managed the building until the start of a major redevelopment in 2012. 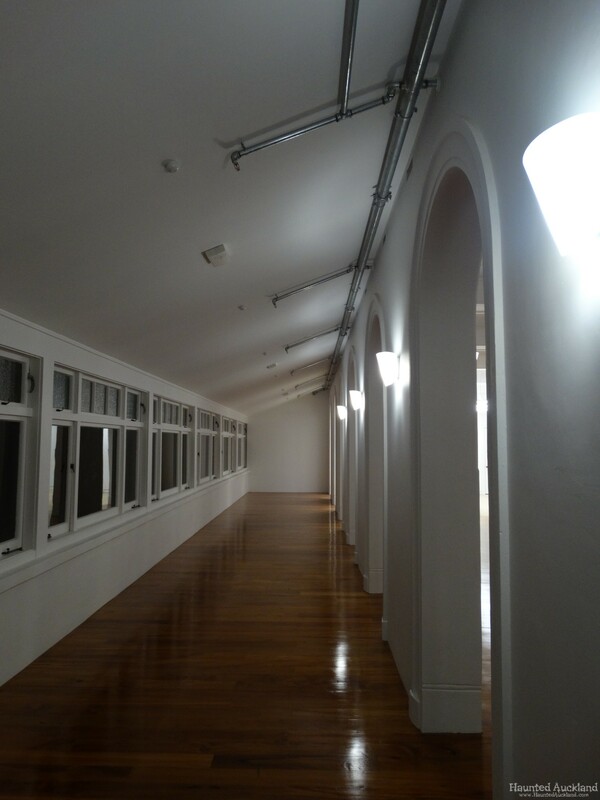 They sublet other spaces to other organisations including McCahon House. Significant additions were made to the rooftop and, for a period, a restaurant operated in the rooftop extension. Construction work began in 2012 and all tenants moved out, leaving the Lopdell House Development Trust to take over the lease from Lopdell House Society and become the developers of a new precinct, a project that included refurbishment, restoration and earthquake strengthening of Lopdell House and the addition of a new, purpose-built contemporary gallery building as part of a larger precinct along with the Treasure House behind. 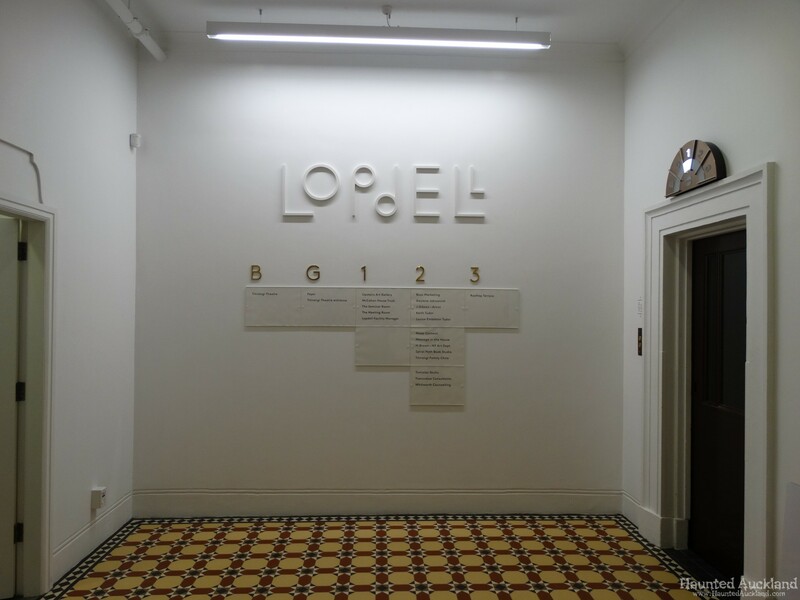 Lopdell House was completed and reopened on Saturday 1 March 2014. As part of the building’s refurbishment, the exterior paint was returned to its original white, having been khaki green for a period and salmon pink. Another feature of the restoration, designed by Mitchell and Stout Architects, was the removal of rooftop additions from 1935 and the 1980s, to reinstate the rooftop terrace. Community arts have flourished since. What were once the hotel rooms now appear to be rooms that have been rented out and used as office blocks for smaller businesses, therapists and non-profit organisations. Barbara – Downstairs from the main entrance was a theatre with a bar/reception area, dressing rooms and bathrooms. 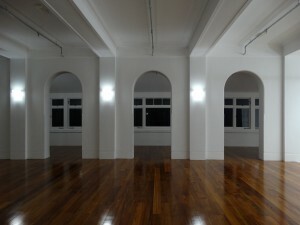 On the ground floor was a large empty white room which had a series of arches down one side. On the first floor was a corridor with an old-fashioned bathroom at one end and doors down each side. At one time the doors would have been to hotel rooms but now housed businesses and offices. 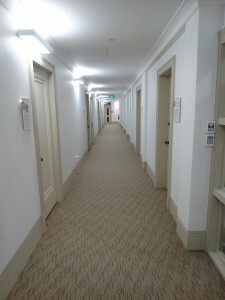 We were unable to have access to these rooms apart from the manager’s office at the end the corridor. The second floor was very similar but we had access to a meeting room and a vacant room above the manager’s office. There was access to the roof via the stairway. The roof area had once been a restaurant but now is a tiled area with low sidewalls which can be used as an outside area. Sam – What an amazing building. 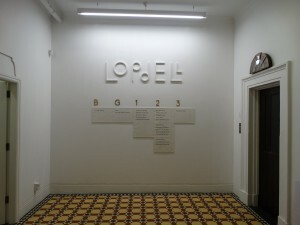 My first impression of Lopdell house was that it still looked like a hotel. I felt as though I could have walked in on its opening day in 1930 and expected to see much of the same layout. I’d only ever seen the old-fashioned “sliding gate” elevators that it had, in movies. I was almost disappointed to see that there was no bellhop waiting for me inside asking me what level I wanted to be on! It was interesting how similar each level of the building seemed to be. I found myself on a few occasions feeling lost and confused as to which level I was on despite the fact that finding my bearings really shouldn’t have been that hard. The corridors ran down in a straight line with room doors mirroring one another all the way down. Standing at one end and looking down kind of reminded me of the famous scene in Stanley Kubrik’s version of “The Shining”. Ian – It was a nice relaxing day but a wet evening. 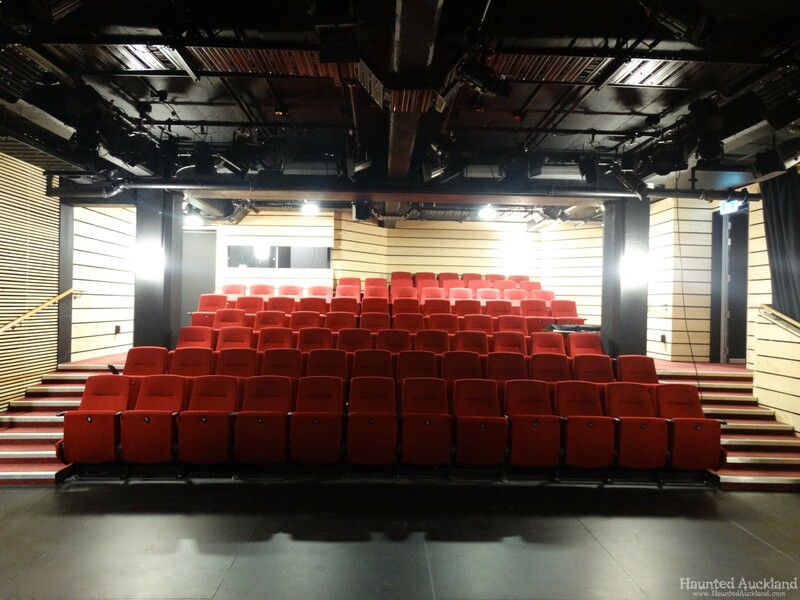 It is a beautiful building and has just been newly renovated. We entered through the main door. The building is protected by a high-tech/ modern security system, it is all freshly painted, modern and still retains some of its original character. We had a tour around before being left with access to most of the building. I did not have a different feeling when entering, I was just thinking how good the place would be to live in. The main art gallery area is a nice place to stand and look out at the rain. It has wooden floors and feels like an oversized apartment. It has pillars running along the windows on either side and behind the back wall has a row of toilets. I am guessing this may have been the old kitchen area as this is where some people claim there has been activity. 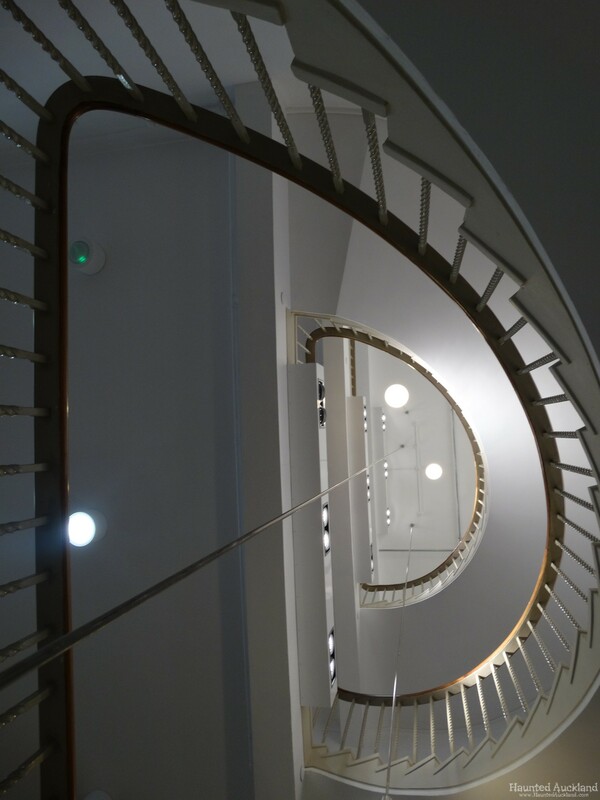 Matthew – The gallery appears to be quite tall and narrow compared to other buildings in the area. Perched on the edge of a steep slope. The ground floor consisted of an open space with pillars which was undergoing renovation. The upstairs floors consisted of approximately a dozen individual small offices on each floor for various organisations. 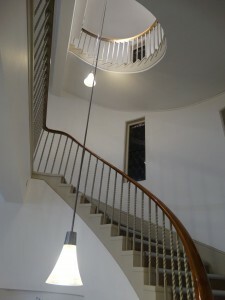 While the structure of the building was old, the office interiors were all renovated. The building was quite comfortable and devoid of any “creepy” areas, even in the unlit parts of the building. 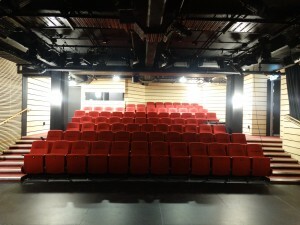 The fact that most of the building had been renovated inside made it feel quite open and modern. Barbara – This is a lovely old building. It was very well renovated and looked modern and well maintained on the inside. 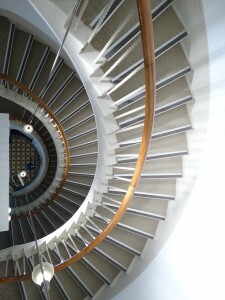 It had sweeping, ornate curved stairways and still had the old-fashioned lifts that had the cage-type doors. Each area of the building had its own “feel” from the open-planned art gallery area, the hallways with offices off to each side and the tiled roof area. Later in the evening it was commented upon that the Vacant Room felt a lot chillier than it had during the initial walk-through but upon checking the temperature in the room the thermometer did not corroborate this temperature drop. Barbara – We did EVP (Electronic Voice Phenomenon) sessions in the theatre, in the large downstairs “art gallery room” and in the empty 2nd floor room. I also conducted an EVP communication attempt on the roof and in the hallway. We did all hear some odd noises (bangs and clicks) during both the EVP sessions and while investigating, but upon reviewing the audio they are not easily heard so were dismissed. I have also caught on audio, what sounds like people talking, but this could have easily been people outside. We asked the usual questions but don’t seem to have gotten any responses. Along with the usual communication sessions, I also tried my spiritbox and Matthew trialled an EVP phone app. Neither seems to have gotten any positive results. Matthew tried playing a sampling of 1930s music, as a trigger, in an attempt to get any possible spirits there to communicate. No apparent responses were recorded. 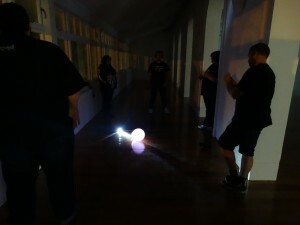 We conducted our first EVP session in the Gallery of the first floor of the building. We couldn’t quite get an exact location of where the “old kitchen” may have been where the spirit of the girl was previously seen, but it was suggested that it was likely to have originally been in the area where the gallery is today. 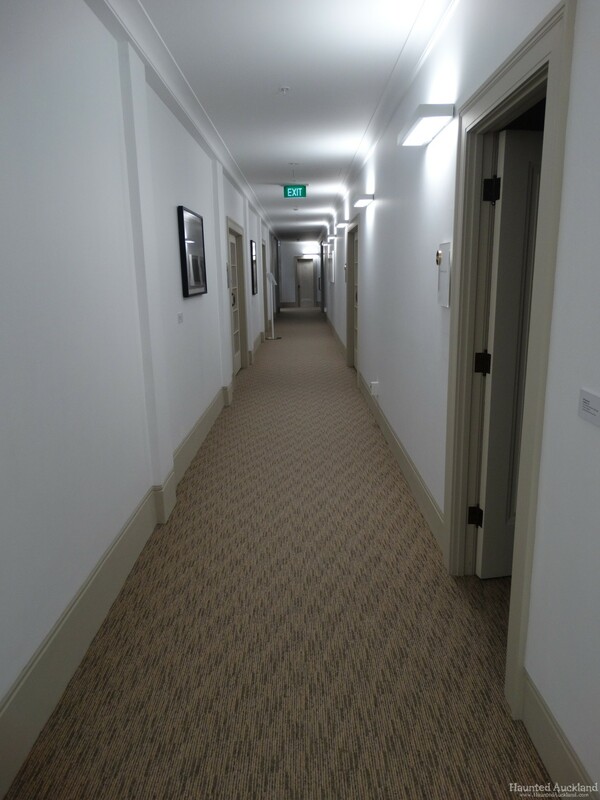 Matthew – I spent the majority of my time in the “haunted” room on the 2nd floor. This was the room which had apparently been a kitchen, and the ghost of a maid had been reported by former staff members. The room itself was a little damp, which may explain why it was unoccupied, but it was an otherwise unremarkable space. 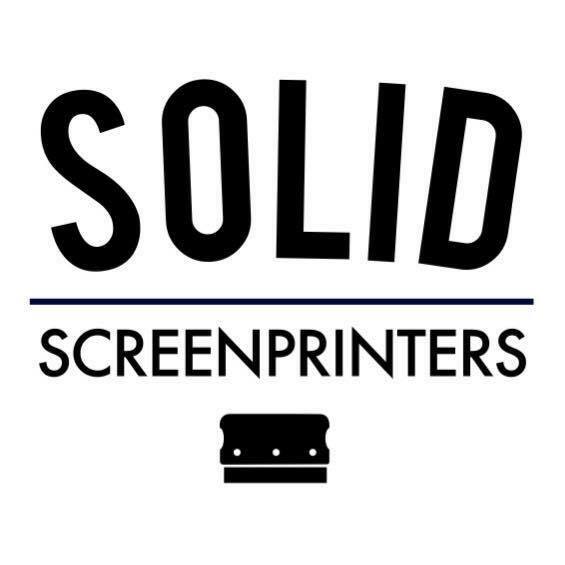 It was unfurnished apart from a two-seater couch. A recorder left in the room for the entire investigation did not pick up any unusual sounds or voices, and nothing visual occurred during the time I spent in the room. EMF readings were standard, with no “hotspots” or anomalies noticed. Photos taken in the room did not yield anything unusual, or were too dark to make out any details, depending on the camera or exposure settings used. A balloon was used as a trigger object in this area as well as having set up a laser grid to pick up any possible movement. Upon viewing photos taken in this area during the session there appear to be some images that seemed to have a few unusual light anomalies and shadowing that appeared interesting. We did eventually come to the conclusion that this was likely the result of passing car lights shining in through the windows. Nothing unusual was found upon reviewing the audio recorders. A second EVP session was held in one of the vacant rooms on the third floor of the building. It was this room that the tenant complained that the window would open by itself. Mark tested the weight of the window by opening it. It was clearly a window that heavy enough for it not to stay open by itself and there was no clear reason that we could find that would indicate that it could open by itself without assistance. DVR cameras were set up in this room as well as one camera aimed down the corridor outside of the room. During the session a few noticeable bangs were heard from outside of the room coming from either the corridor or one of the other rooms. The lights down the hall were automatic and are triggered to turn on when sensing movement. 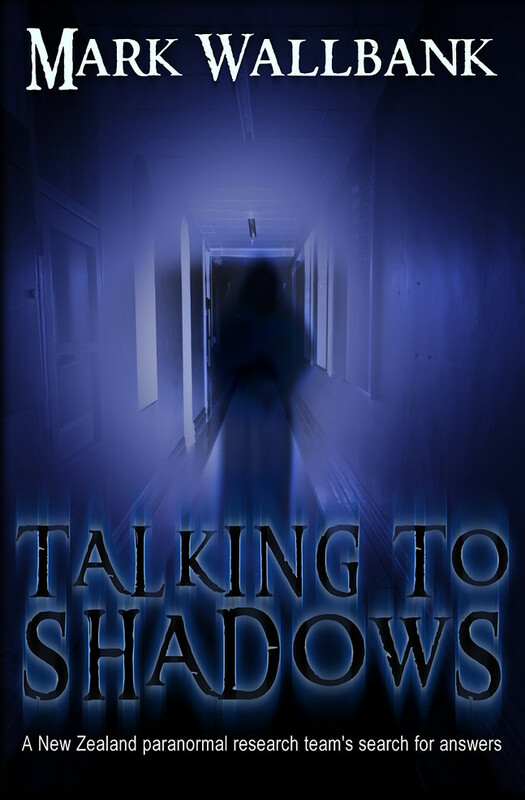 None of the noises we had heard had triggered the lights to turn on suggesting that the noises were indeed coming from one of the other rooms. Unfortunately these rooms were occupied by businesses during the day so we were unable to investigate further as we did not have access. Ian – There were a few noises through the night but there were also machines and equipment in the building making various noises. I did not record any evidence and nothing in any video I took. I would expect if there is going to be any activity it is going to be now, since renovations have been done. Barbara – I didn’t like the concrete stairwell. There was an odd chemical odour in them and I felt uncomfortable there. My camera malfunctioned while I was in the stairwell and was fine for the rest of the investigation. I was drawn to the large “art gallery” room also. It had an interesting feel and I had heard stories of the lady who once worked in that area seeing a girl there. My camera malfunctioned in the concrete stairwell while I was between floors 1 & 2. 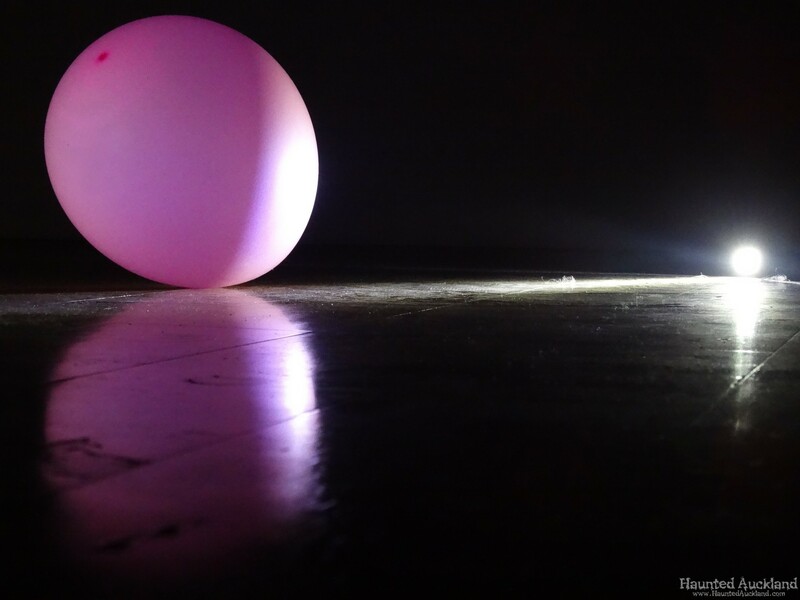 About a minute before that happened I felt uneasy and had a sense that someone was with me. While the group was in the vacant room on the second floor we all heard a noise outside in the corridor. This was followed by the lights in the hallway turning on (they were on motion sensor) and what sounded like footsteps. We thought that perhaps a security guard was coming but it turned out that the security guard had been cancelled for that night. I stood up a torch and invited anything present to knock it over. I also stood a couple of playing cards against each other and asked that they be knocked up over. Both items remained standing. 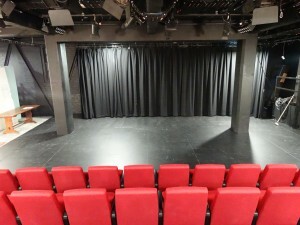 We did EVP sessions in the theatre, in the large downstairs “art gallery room” and in the empty 2nd floor room. I also did an EVP session on the roof and in the hallway. We did all hear some odd noises (bangs and clicks) during both the EVP sessions and while investigating but upon reviewing the audio they are not easily heard. I also have caught what sounds like people talking but this could have easily been people outside. We asked the usual questions but don’t seem to have had any responses. Matthew also tried playing 1930s music in an attempt to get any possible spirits there to communicate. Note: Some of the group thought the vacant room had a large temperature drop but the actual temperature readings remained constant throughout the investigation. 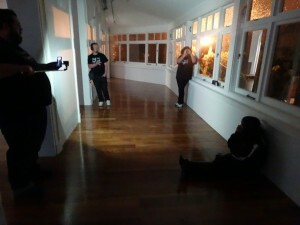 The Team carried a class two investigation of Lopdell House in Titirangi. Upon arrival we did a walk-through of the entire building (including the theatre in the basement and the roof-top where the old restaurant used to be). Temperatures were noted and monitored in all areas of the building ane a sweep was done for EMF fields. 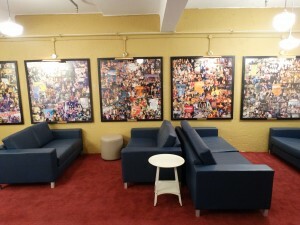 We then took hundreds of photos, hours of video and audio recordings throughout the whole building. Some areas of the building were also monitored by DVR Infra red cameras. We then focused on a few key areas (theatre, large ground floor room, 2nd floor corridor and vacant 2nd floor room) and conducted communication sessions there. Unfortunately, although there were some unexplained noises were not able to capture any evidence of paranormal activity. Sam – Personally I didn’t get much of a feeling at all from the Lopdell house which was a shame as it was an awesome building that by looking at it you could tell that it had a rich history and many stories to be told about it. It’s the kind of place you’d almost want to find a spirit or two but unfortunately my feeling is that it’s just not the case here. I still however consider the night a successful outing as I finally had a chance to meet Karen and Matthew for the first time since joining the Haunted Auckland team. Many interesting stories and theories were shared between us all on that night which I enjoyed. Ian – It was a big building, a lot of space to cover. I think we did the best we could, we covered all the areas that activity was reported. I took audio recordings in the rented floor 2 room and we got to see most of the building. It is a beautiful building, we were lucky to spend some time there. I don’t believe there is any activity there now but its nice to hear from past reports that they were all positive experiences, I’m guessing residual ones. I have not heard any stories of any contact with the spirit, just a friendly young maid walking around the building. I think the art gallery will be very good for the town and hope the rooftop restaurant is reopened. They have done a very good job renovating it. I hope to visit the gallery sometime. Barbara – It was a very quiet investigation with very little activity. The group worked really well together and it was a nice relaxed night with lots of time to chat with each other. convince me that this building is haunted. This does not mean that the building is not haunted but simply that I saw no activity to prove or disprove a haunting. 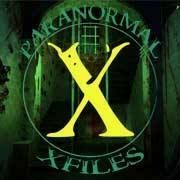 Matthew – Personally I did not see or hear anything during the investigation which would lead me to believe that the location was haunted. Most buildings of this age tend to have some stories attached to them about ghosts or unusual activity, but often it cannot be substantiated. Stories get passed from employee to employee over time, and the details are changed and origins become lost. It is odd that the one “haunted” room in the building was not occupied for use as an office like all of the other rooms on that floor, so there may have been something about that room that made people uncomfortable. Whatever that may be, it was not something which I could measure or perceive during our time there. Mark – It was a great privilege to be granted unsupervised access to this beautiful and iconic landmark. I’ve been wanting to go behind the scenes within those walls for many years now, so to finally get to knock it off my bucket list is something special personally. After reviewing all our many hours of video footage, audio recordings, around 1000 photographs and pages of gathered data and meter readings, we didn’t spot anything which we would consider overly unusual. The stories surrounding this place are fascinating and I’m sure that to those that have been lucky enough to experience this activity, they are thought-provoking and memorable events. However, after our six-hour session within the building, we were unable to capture or document anything we would consider even borderline paranormal. We were told the activity is sporadic and not often , so the chances of it happening while we were there were slim at best. But as with everything in this field, it’s about trial and error, much experimentation and being in the right position at the right time with the right recording equipment aimed in the right direction, to be lucky enough to capture the elusive evidence needed to prove either way if the location is haunted, or not. A huge thank you to the staff at Lopdell for your trust in allowing the team unaided access after hours. It was a thrill and an honour. Lopdell House is a beautiful place, nestled amongst the ferns, flax and Tui calls in the peaceful community of Titirangi. If you’re after a relaxed weekend escape sometime, pay Titirangi a visit, and if you pop into Lopdell House to check out an exhibition….say a quiet ‘HI’ to the resident spook for us, will ya? Thanks for doing such a thorough look through lopdell house I had always wondered about it when I would walk past in on the way home from school how ever something somewhere may have to do with the local school (Titirangi primary school) burning down in the early 19th century ironically next to where the current fire station is just a few doors down from lopdell house. Titirangi primary is now 144 years old after originally being made in 1872. It has since been moved up the road to its current position. 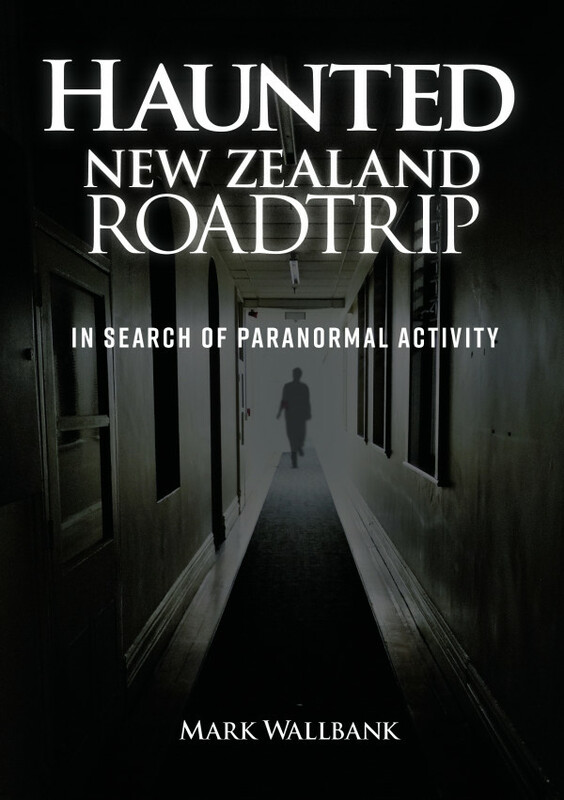 I have grown up in Titirangi and have always had a interest in it’s history so if you happen to be in the area investigating or just doing what ever I would happily answer any of your questions that you may have to do with the history this also includes all the way up the coast up to piha and all around the manukau harbour.